They say all publicity is good publicity, though that’s rubbish really: look what happened when Jo from S Club 7 went into the Big Brother house. And in the case of these ten cars (well, nine of them), we’re sure that each manufacturer would rather not be here: every one of the following ten incidents has made the car infamous by virtue of some tragedy. Already infamous, the legend of 1930s-era bank robbing murderers Bonnie Parker and Clyde Barrow was cemented with the 1967 movie Bonnie and Clyde, starring Warren Beatty and Faye Dunaway. 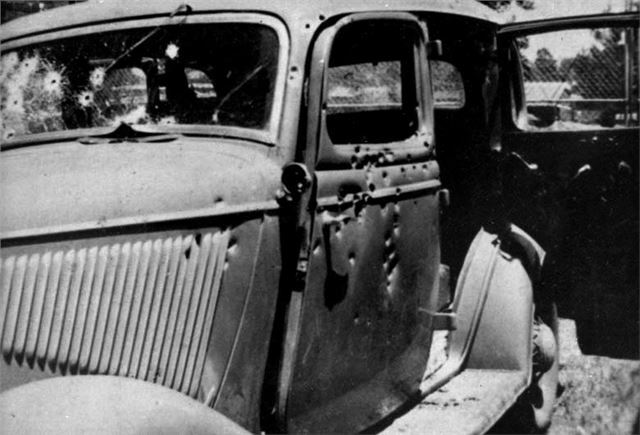 The couple’s stolen 1934 Ford V8 is infamous because they were in it at their gruesome end, when a group of six police officers from Louisiana and Texas ambushed them, opening fire and riddling the car with 130 bullets. The car became a travelling attraction in the subsequent decades, before finding a home in Whiskey Pete’s Casino, Nevada.